My name is Dalia Gottlieb-Tanaka. In 1999 I realized that there should have been more to the art activities I witnessed in care facilities. 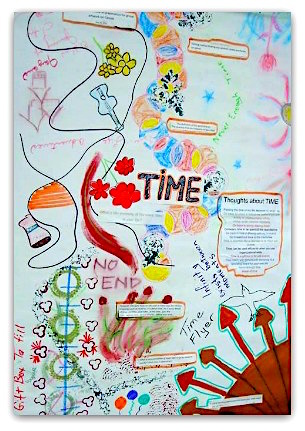 This was the start of my program I named The Creative Expression Activities Program, and I still work on improving it, as my understanding of people living with dementia deepens and as my own process of aging brings new ideas into focus. I have a working space at the Schubert Centre in Vernon, BC. It is a make-shift studio. I need to transform it to a studio each time we have a session. Ideally, I would love to have an art studio for what I do, but I decided that the lack of it should not stop me from engaging others in the arts and so we make do with what we have and it works most of the time. 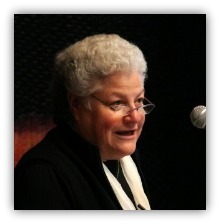 I serve older adults who may have memory decline due to various reasons including dementia. 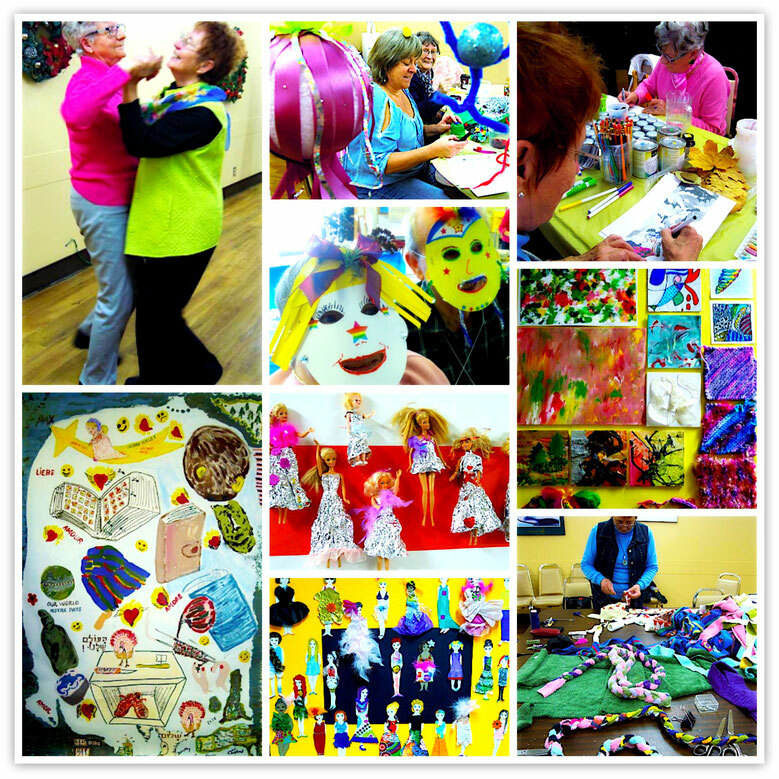 Most of my group participants understand that being engaged in the arts is beneficial to their health and memory. So they become proactive and do whatever they can to postpone the possibility of developing dementia. 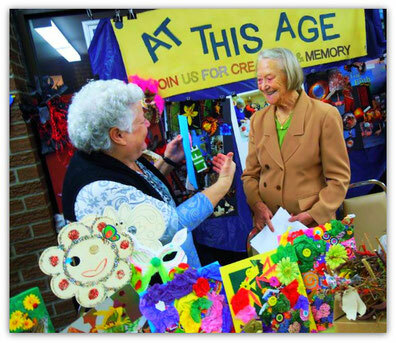 I love interacting with older adults since I enjoy introducing them to a variety of art activities sometimes for the first time in their lives or after many years where opportunities were very few to do so. studio/workspace, and describe the emotional “atmosphere” of your sessions. A careful preparation of each session is based on preparing the background information of a specific topic, explore together with the client their own relevant experiences to be shared with the group (only if they want to). All discussions are conducted with respect for the participants in order to create a safe environment so all clients can talk and share their stories. When topics are relevant and handled properly, I witness some incredible sharing that can be emotional at times. However, most of the time others in the group offer emotional support in one way or another. By creating a safe environment where no one is being criticized but listened to is very important. Sometimes just telling what is on someone’s mind/heart is already part of the emotional relief. I use anything under the sun that human beings do during the span of their lives. It can be anything from a topic on friendship to sailing, cooking, knitting, singing, acting, arranging flowers, learn about World War Two, architecture, fashion, art, music, nature and so on. Each topic is explored and presented on, followed by a discussion and sharing life experiences. The discussion is followed by an art activity relevant to the topic, poem writing or storytelling. I am always amazed at the readiness of my clients to share their life experiences. I am also amazed at the courage they have when facing difficulties and the support they are ready to give each other. Such responses make my day and my efforts all worthwhile. In all of this, I love their support of my work and their friendship. 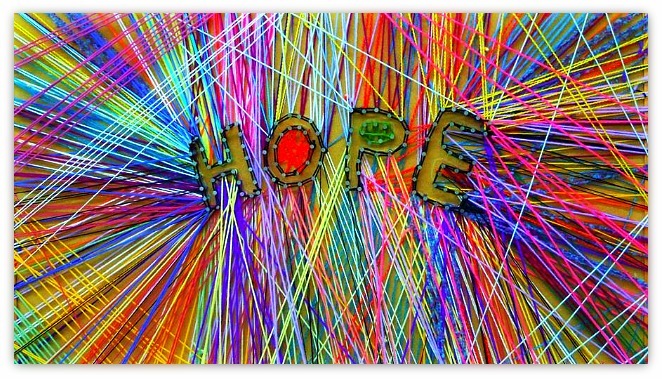 connection, or emotional or psychological healing for an individual member of your art group? Each member has gained confidence over time to express oneself creatively. Some individuals who never acted on a stage got the courage to do, and do it well. Some started to paint, sing and dance. Basically they learned to not be afraid of trying new things. They all love getting together socially outside the group’s regular sessions. They learned to be self-led and they meet even when I am not around and absent at times for several weeks. I don’t have a proper art studio. Although I volunteer in a seniors Centre, the majority of the seniors (1000 members) are not interested in being engaged in the arts. Many would rather play bingo, Thai chi or travel. I think they see the arts as an activity suitable for children only. However, when they allow themselves to be involved they discover another world of enjoyment. The difficulty is to bring them over the threshold to try it at least once. I just love working with older adults. I find them fascinating. I love their stories. 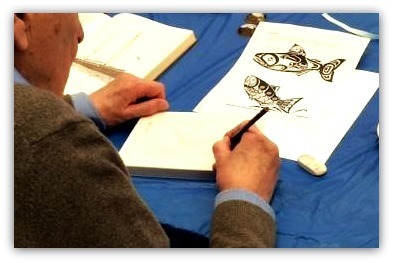 What makes my art program unique is the mix of all artistic mediums that appealed to all the senses of people living with dementia. I never approach my clients from a sense of being superior to them. I am one of them. Although they are coming to learn from me, I often learn from them. It is a two way approach and a win/win situation.